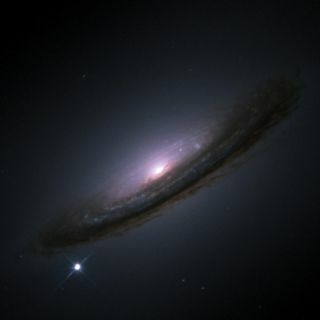 Formed when a white dwarf devoured its companion star, Supernova 1994D shines brightly with its parent galaxy NGC 4526. In universe spanning more than a billion light-years, distance can't be measured with a ruler. To judge how far away objects are, astronomers must rely on other objects whose properties are already known — such as certain kinds of exploding stars called supernova. New research is shedding light on the identity of one of these "standard candles," so-called because their brightness is standard enough that their true distance can be deduced from it. Astronomers are hoping that analyzing one specific type of supernova explosion will give them a better understanding of how frequently it differs from another type. That, in turn, should allow for even more precise measurements of distance in the universe. When a compact, dying star known as a white dwarf orbits another star closely enough, its strong gravitational pull can ultimately rip its partner apart. But the massive survivor can pack only so much material onto its surface. When its critical point is reached, it explodes as a Type 1a supernova. When two white dwarfs are orbiting one another and the smaller one moves too close, it is almost instantly torn apart, creating a disk to orbit its destructive companion. Almost immediately, the disk falls onto the remaining star, pushing it over the critical mass threshold and causing an explosion. But when the second star in a pair isn't a white dwarf, things move slower. The stars don't get as close, and tidal forces manage to pull away only some of the gas from the near side of the second star. The white dwarf feeds on the material until it eventually reaches the critical mass, exploding as a supernova. "Both models agree that the explosion is an accreting white dwarf," the lead author of the study, Assaf Sternberg at the Weizmann Institute of Science in Israel, told SPACE.com via email. "The disagreement is on the origin of the accreted material." It is this material that interested Sternberg and his team. When the destroyed star is a white dwarf, the material is quickly consumed, but when it is not, traces of the gas linger even after the explosion. This Chandra X-ray photograph shows Cassiopeia A (Cas A, for short), the youngest supernova remnant in the Milky Way. The international team of astronomers used the Keck telescope in Hawaii and the Magellan telescope in Chile to study the sodium in gas clouds around 41 Type 1a supernovas. Sodium is an element found in most stars but not in white dwarfs. From the sample taken, the team determined that at least 24 percent of the explosions did not involve white dwarfs as the companion. This number was a lower limit: Half or even all of the pairings could involve only one white dwarf star. The researchers couldn't specifically target which explosions contain white dwarfs and which do not. Instead, they looked for a distribution. They found more systems with sodium than would be found if there were an equal number of double-white-dwarf and single-white-dwarf systems. Josh Simon, of the Carnegie Institute, explained how this event helps determine distances in the universe. "If you know that the light bulb is 60 watts, then you can figure out how far away the light is from you by measuring how bright it looks," he told SPACE.com by email. But the second star in the set could be a number of things. Simon likened the different pairings to light bulbs of varying wattage. "You can't tell the difference between a 50-watt bulb nearby, a 60-watt bulb a bit further away, or a 100-watt bulb even farther away than that," Simon said.